Do you have goals you want to achieve? Do you struggle to achieve some of your goals? If you’re someone who has a goal in mind, you’d want to make sure that you’re on the right track in order to finally see things come to fruition. You may have a plan which is pretty much a key to your success, and you’re motivated just enough to actually pull through with your goals. However, as time goes by, the steam starts to dissipate into thin air, and soon enough you find yourself going off-course. If you really wish to finally achieve your aspirations in life, you’ll need to incorporate these 3 Critical Success Factors. 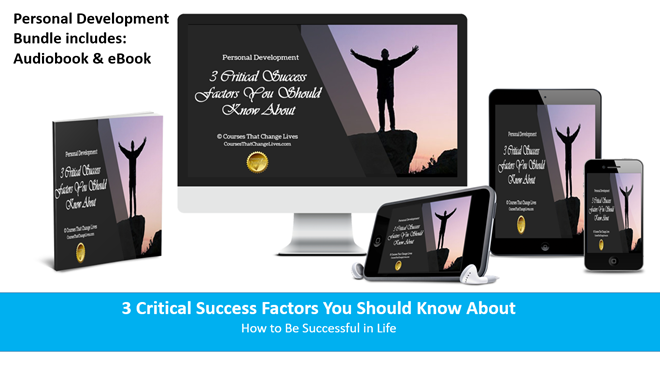 The critical success factors you’re about to discover can help you obtain all that you desire in life when you follow through and put them into action in your life starting today. Download the audiobok and ebook now and let’s get started!